My fat story: Don't amputate a healthy part of your body! Why do everyone think that it is the stomach who make us fat, sick and depressed? Why should we remove a big part of our stomach and intestent just because we are sick or obese? What did that stomach do, to deserve that? It workes just as it is supposed to do, intest the food you eat. 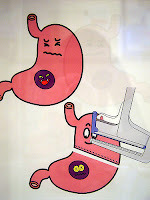 But if you put in food in your sensitive stomach wich make you sick or fat, you can still not blame your stomach. There is many reasons why you get sick or fat - it is not the stomach who is the problem! If you got migrains - do you cut your head off? No, didn't think so, because you know that you need it! The same reason - you need your stomach! Over the years I lived with my amputated stomach I realised that it is not the heart who is the center of my body, it is my stomach. When I got my flickering heart, I didn't feel any pain, just feeling very uncomfortble but when I get something bad in my stomach, my whole body feels sick. Nothing workes when your stomach is in pain or any kind of unbalance. Those people who wants you to reduce your weight through amputation of your stomach, don't think about you - they think about them selves! They are the ones who gains something out of your missery! Not you! You think that your weight is making you misserable, but you don't really know what missery is when your stomach is not working anymore! - That will not happen to me! Nobody knows how many out there actually died from the surgery, because they don't want to tell you! They will tell you that you will be free from your Diabetes 2 and loose your weight! And they will tell you to continue eating fullgrains, pasta, potatoes, rice, fruits and strange shakes because it is good for you! The onlny reason you might be free from your Diabetes2 is that you eat a lot less than before but after a while you will also realise that you CAN eat those things you got sick and obese of, from the beginning. There is statitics about the risks but I promisse you, those numbers are not true. In Sweden they count the numbers of deaths, just the next 30 days after the surgery. If you die, day 31 you are not in the statistics. If you survive but are so sick that you can't live a normal life, you are not dead and wont be in the statistics either! You are just a number, something to get money from. What happens to you, your family and your life is not important!
" I had GBS in 2007 and it's ruined my life!! And there's no turning back once it's done!! I would rather be back to the somewhat healthy 250lbs me, then the very unhealthy, sick all the time 115lbs me. I was diagnosed May 2011 with Epilepsy. So rhyme or reason. Just started having massive tonic colonic seizures. I'm no longer allowed to drive and waiting on approval for SSDI at age 32. And I believe 100% this was caused by Gastric Bypass along with the other physical issues I deal with daily. The neuro doctor I go to won't confirm the seizures are caused by the surgery. I can't believe someone with no fam hx or head trauma is just one day going to have a GM seizure. Ive done some research that suggests being so malnurished can most deff lead to seizures. And I'm deff malnurished. I just don't know how to look into it further. I wish there was a dr out there that could/would do testing to prove the surgery caused that. Every time you watch tv there's a new commercial for a "bad" drug and to call a lawyer. What about GBS gone bad?!? Being 5 yrs post op I eat anything I can keep down. Right now I can't stomach meat. It's mainly high fiber cereal, or soup. I "eat" a bag of ice a day and drink maybe 8oz of crysal light. Pretty much it. My sugar goes crazy with off the wall foods. I crash to the low 30's, even as low as 25 at one point. I can eat a candy bar and be fine but eat a bowl of pasta and it drops. It's really weird. I would love to start a site talking about the "dark" side of GBS. The side that they refuse to talk about. When people go to support groups to get info about the surgery no one stands up and gives the cons about it. It's always how it saved their lives. Well what about us that it's ruined!! I just don't know where to start, or what I could really do to help people. I wish I knew doctors that would back this up to prove that our issues aren't in our heads that they are real. My kids are 12,7, and 4. I got preg 6 months after surgery. I was still in the rapid weightloss time frame. But that's when I felt the best. I'm sick everyday. I just don't feel well at all. My kids just started school and my day consists of laying on the couch. I have no energy to do anything. During the summer that's pretty much what my kids see. Mommy sick laying down. My oldest moved in with her Aunt 2,300 miles away (Nashville, Tennessee) because I couldn't keep up with her school work. That and my 7 yr old has ADHD so they would fight all the time and I just couldn't deal. I miss her like crazy. She comes home for Christmas and summers. But that family has taken full control and I'll be lucky if I see her again : ( i feel im a horrible mother because i can't go out and play with them or pick my son up and play. I had the surgery done pretty much because my husband would call me names and make fun of me. He left me February 2007 the next month I had the surgery thinking he would want me and come home. Not the case at all. Now he calls me a crack head because I'm so thin. I hate my body. I may be 115 pounds but look fat because of the hanging skin. I think I'm harsher on myself now then before. It's ruined my intimate life, well my whole life in general." This is just ONE story, I just copied from the group! This is happening all over the world! 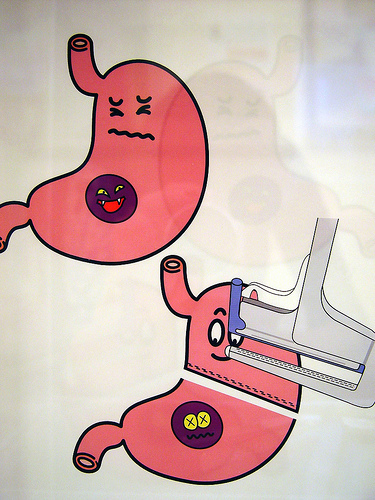 "Weight loss surgery, cutting away healthy stomach organs, is promoted as the only effective treatment for obesity. But the cracks are starting to show now – not surprisingly. Yesterday a 20-year follow-up of the largest study on weight loss surgery was published and it could be the largest setback yet. It turns out that obese people undergoing weight loss surgery get an INCREASED need for medical treatment, even years after the surgery. Despite their weight loss! For example they need more inpatient care in hospitals. During the first six years after surgery the increase is very large (see figure above). The cause is either complications from the surgery (like bleeding, infections, leakage of stomach contents into the abdominal cavity) or long-term dangers like bowel obstruction, anemia, gallstones or malnutrition. Obese people who did not receive surgery ultimately needed less medical care. So how healthy is it to lose weight by surgery? There was also an increased need for psychiatric medications (e.g. for depression and anxiety) for weight loss surgery patients. We need a safer and wiser treatment for obesity. Amputating healthy organs is just an emergency solution. 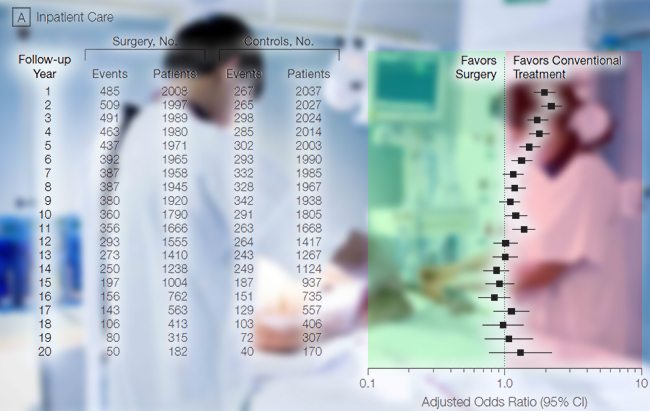 We need to stop giving simplistic calorie-fixated advice (the least effective advice in study after study) before exposing patients to risky surgery. These operations should be the last resort. Thus patients should first be offered advice on low carb (the most effective advice in study after study) and adequate support. Weight loss surgery may be extremely lucrative for hospitals (the complications are an added bonus!) but if you are a patient: Be warned. And make sure you have good insurance." Change your way of eating and do NOT listen to all those doctors and dietists who put there own wealth in front of yours. Where is the benefits for you in this? This is worse than I ever could imagine when I put my self under the knife 1995. If I had known what I know today - I WOULD NEVER DONE IT! Now you know it, you don't have to do it!